It's been four months since i landed here in Jo'burg! The question that i am asked when i meet new people here is, "How do you like Jo'burg?" and i immediately say, "Good!" I have never been able to say more. I have quite a few impressions but find it difficult to articulate them. A new country means change! Everything around is new - People, Culture, Surrounding, Public systems, Food, Clothing, Climate, Politics, History, and more. When i landed here in August, i had no expectation of the city and was geared to take in any experience that came my way! This attitude to larger extent has helped me sail smoothly. I had a vision only till Dec'2011 and had decided to make the most of this break from work to pursue my interests and discovery myself! Have i succeeded ? To a larger extent yes. Time for yourself is something everyone dies for and when you actually get it, one doesn't know what to do with so much time! I did execute most of what i intended to and did miss a few! I guess life works that way - if you get to do all what you want then, where is the fun & improvement? Some things i do to spend my time - Read, Write, Learn, Pencil Sketch, Cook, Clean & Sleep! And in these four months, i got to live my plan of traveling Italy & Paris. Well, to talk of Jo'burg as a city - it is modern and impressive. The road infrastructure is good providing quick connectivity. The city lacks a good public transport system and that being a bane for me! I prefer to take public transport in a city when am not hurrying for work - they are the best means to understand the life in a city. The biggest drawback in this city is the prevalence of crime! The lack of good public transport system coupled with crime, prevents you from venturing into the city which i desire the most. You will hear of some incident every day from cases of petty crime to murder. Well, there is crime everywhere in the world just that little more here ;-) What bogs me down further is not the crime by itself, it is the fear of being a victim. You can hear talks of crime everywhere and i don't like it. Even if you put everything behind you and get ready to walk on the streets, you will hear everyone advising you and narrating horrific incidents to put some sense into your head! Now, would you even try to get out on your own? Just so i keep my loved ones happy, i stay indoors. It is not as bad as i am portraying, i get to go out 3-4 times week and even at nights but with my spouse and friends in a self-driven cars! I believe it limits my world. Can this really replace the experience of taking a stroll on your own to buy a coffee and spend an hour reading a book watching people on the streets? Business here closes very early. You can't shop beyond 6 P.M. Yes, you heard me right! Even supermarkets, chemists close by 8 P.M max. Roads are deserted. I find the city to wear very dull look in the evenings. We have such wide roads like on the Highways, with no shops, no lights and no people!! I miss the light, color, noise, and vibrancy that a city sports. As an outsider, you aren't much bothered about the Nation's politics though i realize the citizens are quite unhappy with the regime. The public systems are well organized, you can get your work done in any Department with no hassles. From what i hear, i understand that water & electricity are expensive and scarce, though you get them 24 hours a day! 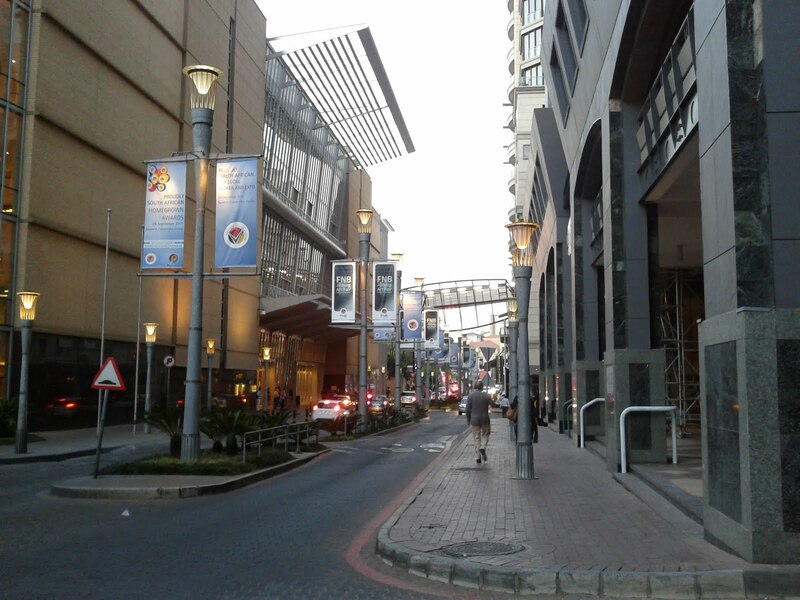 Living in jo'burg is synonymous to living in a well organized modern city. There is grandeur but no fun! There are certain things Indian that you will never see in another country! The pure pleasure of gobbling pani-puris from the roadside shop, scores of people waiting at a bus stop with a tea shop in the background, the chaotic crowd at a train station, the line of small grocery shops illuminating the street, the noise, vendors on the pavement, the hurried busy streets and a lot more! Here, to eat Pani-puri/Sandwich, one has to take the car, drive more than a mile. I am at least glad that i get pani-puris :-) Slurp! Slurp! sorgame endralum nammoooru pola varuma ? but by the time i came to the end of the post, hmmm well....at least you experienced or are experiencing something different. South Africa is known for its gaming, safaris and adventure. @Anand Haha..! Didn't wanna portray it that way thou ;-) Facts are Facts! I have visited the city a couple of times. I get impressed by the posh hotels, well laid road, shopping complex, etc. Living there, it looks like, is quite different from visiting the city for a couple of days. @Hariharan True! Yes, the city is modern and every amenity is available but living is a different story..